The kid’s dugout canoe rode low in the water. About 1-inch cleared the surface and the whole thing felt like it was balancing on the head of a pin. He was rowing me across a half-mile wide tributary of the Amazon and I was sure the ripples ahead would swamp us and we would be guests of honor at a piranha banquet. So, I decided that I would help row to speed the inevitable. Funny thing these canoes, in the middle of the river the bow wave pushed the dreaded ripples aside and when I found a second paddle and started to row, the craft began to stabilize. Did the effort of two paddlers somehow balanced the canoe or was I preoccupied with the rowing so the kid did the balancing? Well, we made it to the opposite shore and the piranhas went hungry that night. I did, though, gain an appreciation of the dugout canoe and those who craft and use them. Later, I discovered that when I was a passenger on an unstable canoe I would "air-paddle" imagining I was helping out and that somehow would stabilize the canoe. Gaze out across the Amazon River and you can always see a family with an impossible load of goods making their way by dugout canoe--hugging the shore while paddling upstream or out in the swift current heading down. 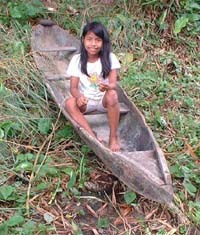 Near the villages, girls use 8-foot canoes as water taxies, running errands or taking kids to school. Big 6-meter canoes carry families and livestock to markets at distant villages. Every village seems to have a craftsman who can fashion a dugout with adz and machete. 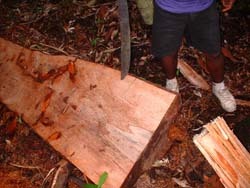 The craftsman goes into the jungle and selects a marupa tree. Marupa is usually Simarouba amara a species that is light weight, reasonably strong and will turn away fungus for a couple of years—good for a simple dugout canoe that will have a short and very abused life. Better than marupa is the prized canela moena, probably a species of ocotea. This wood will last at least a half-dozen years outliving the wear and tear on the canoe. Being a lauraceae it is related to sassafras and carries the faint scent of root beer. The canoe craftsman fells the tree and selects good log of the right size which he then splits lengthwise, and fastens to the ground with stakes around the edge. He uses his machete to shape the outside of the canoe. Shaped wrong, the canoe will become a bote loco; a miserable unstable contrivance best broken into firewood. But if the craftsman knows his trade, his canoe will be stable enough for a local fisherman to stand in and toss a net. With the outside finished, the craftsman turns the log over and with his adz hacks out the inside of the canoe. A skilled builder will fashion the wood into a shell a couple of centimeters thick. His machete rounds off any rough spots. If lucky the craftsman can find a couple of sawn boards for seats or he can split a log into planks. Most canoes are pointed at both bow and stern. Some around bigger towns like Iquitos are sliced off flat at the stern to take an outboard motor. Sometimes the carpenter will add one or two rows of lap boards to the canoe sides making a bigger boat. The original canoe now becomes the plantilla or keel plate for the boat. The ultimate of all this are big 16-meter boats plying the Amazon with inboard diesels, but buried inside are the original canoes. I prefer canoes made from a single trunk and stay away from those with lap boards. A well-carved canoe is symmetrical from side to side and from bow to stern. A new dugout will have the yellow color of fresh cut marupa, but after a few weeks in the river it will weather into a dark brown or black shade. 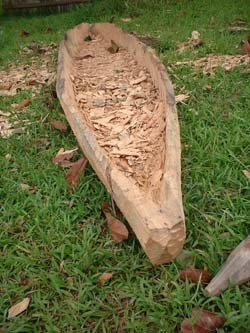 A canoe removed from the water and left to dry will usually split. Repairs were traditionally made with jute fiber, Urena lobata, and resin from the copal tree, Protium. Today, though, one finds repairs are made from common roofing tar and metal patches cut from aluminum cans. maintenance--and they're not light-weight. A fair-size canoe an weigh well over 100 lbs--too heavy for easy portage. These canoes are best used for displays. I export these dugout canoes to the US. where they find their way into the inventory of serious collectors or displays in museums and zoos.